Howdy skin ravers, it's that time of year again where we love to celebrate with costumes and halloween make-up. In past years, news revolving the halloween holiday have focused on allergies from ingredients in halloween make-up products. In 2016, the Breast Cancer Fund (now known as Breast Cancer Prevention Partners) released a publication which focused on toxic ingredients found in halloween make-up as well as products like lip balm, nail and make-up kits marketed to children ages 4-14. This publication is a follow-up to the publication released in 2009 which involved testing of 10 Halloween kits. All 10 kits were found to have lead contained in them. We know lead is neurotoxic, has been shown to affect brain function, and is strongly associated with learning disabilities and developmental problems. In the current publication 'Pretty Scary 2 Unmasking Toxic Chemicals In Kids' Makeup' 187 product labels were read, 51 of them were tested through third party testing to see what toxic chemicals they contained. Reading labels revealed a wide range of toxic chemicals in children's cosmetics and personal care products. Ingredients such as hormone disrupting parabens as well as ingredients sometimes contaminated with carcinogens as well as the frequent use of undisclosed fragrance chemicals. After testing 48 Halloween face paints for heavy metals such as arsenic, lead, cadmium, chromium and mercury, almost half of them were found to contain trace amounts of at least 1 metal. Others contained as many as 4 metals. So what does this have to do with Halloween and why should we care? Can small exposures add up to create harmful effects? Lead and Cadmium - lead in nearly 20% of the Halloween face paints tested, Cadmium in nearly 30%. There is no safe level of lead and is neurotoxic. Cadmium is linked to breast, kidney, lung and prostate cancer. 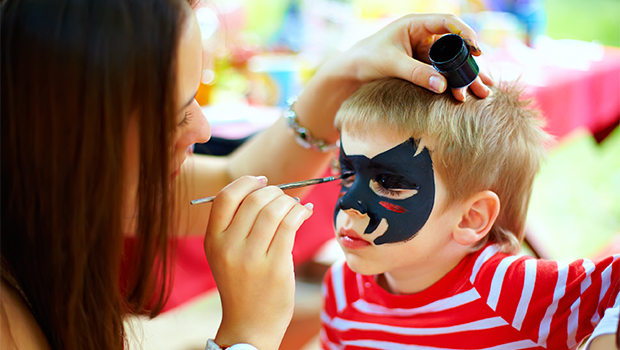 Stay away from face paints all year round, including during the Halloween season. There are lots of alternatives for dress up that don’t contain lead or cadmium. Audit all the children’s cosmetic and personal care products in your home. Read the labels. Follow our science and our scientific method. If there are toxins on the label, throw the cosmetics out. Be particularly wary of any product that says “fragrance” on the label.Throw those out too. Let your kids be kids a little longer and try to delay the use of children’s cosmetics until your kids are older. Be a savvy shopper. Look before you buy, and try apps like Think Dirty, Healthy Living and the Good Guide. Many playful items are anything but that. Share your concerns with the manufacturer of products you suspect contain toxic chemicals that are harmful to kids. Ask for changes. Use social media and share our scientific findings with others. Also use social media to be an advocate for #toxicfreekids. I know these recommendations may seem extreme or "overkill" for what seems like fun and harmless, but I feel it contributes to the larger discussion as to what IS in our cosmetics, personal care products and make-up kits, and not strictly halloween make-up. What if you decide to use halloween make-up? I'm certain this won't be the last report we hear about toxic chemicals in our cosmetics and personal care products..let's all be vigilant consumers to help minimize any health consequences for both our children and ourselves.